When we landscaped our front yard two years ago and wrapped our pillars and added patio furniture – it felt really complete. There was only one thing left on our list to complete that project – update our exterior lights to match our newly renovated yard. Back when the project was fresh on our minds I found a couple lights I really liked but could never pull the trigger because they were just a little too expensive for my liking. I decided to do some more searching and if I couldn’t find anything comparable I’d go ahead and make the purchase. The project was sidelined. 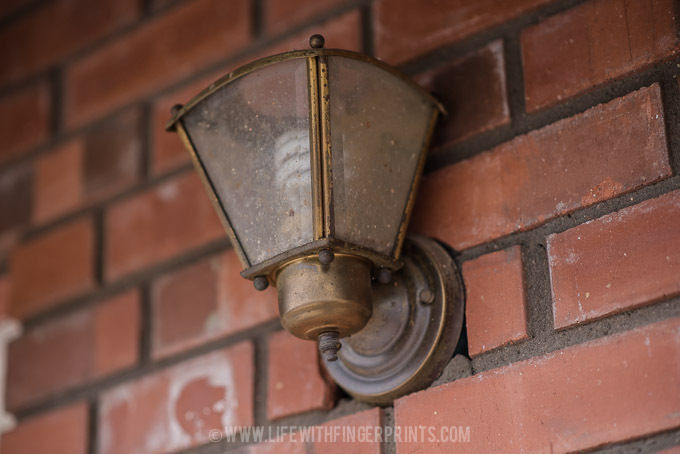 We had a baby and suddenly updating my exterior lights weren’t even on my list! …to bright and modern. 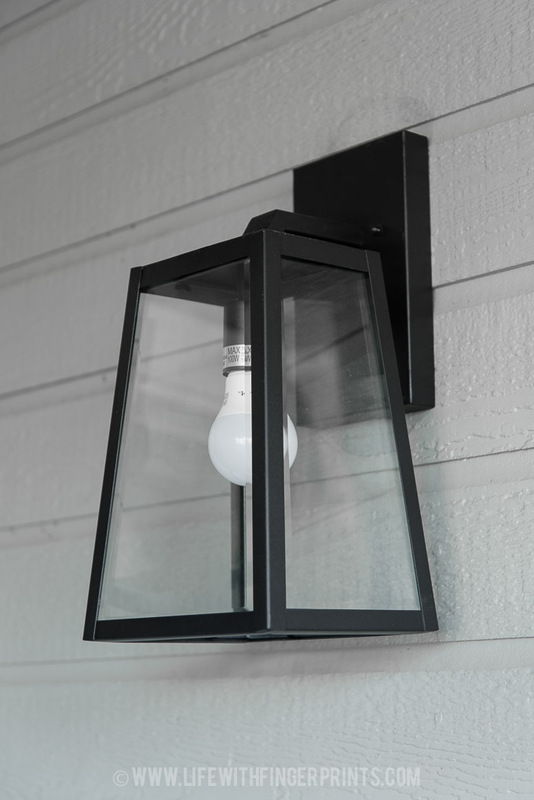 What I love about this fixture is it has glass on the sides, but no glass on the bottom. 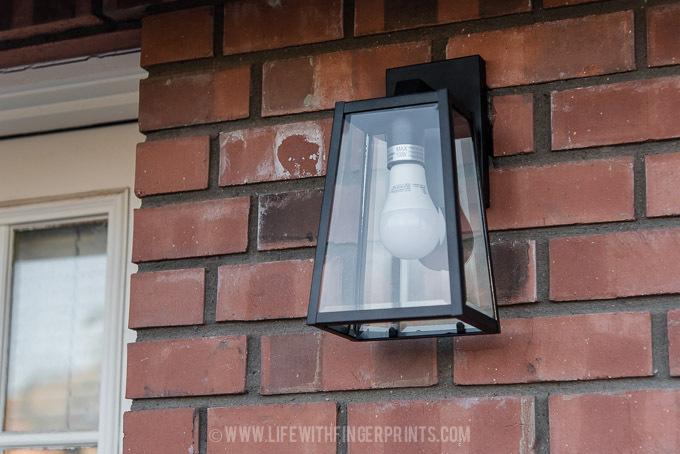 This makes it easier to change bulbs, but more importantly it doesn’t collect dead bugs! The wide opening makes it easy to clean when needed. They’re made by Globe Electric (aff. link) and can be found on Amazon – they’re 13″x13″x5.5″ – so they’re pretty good sized. 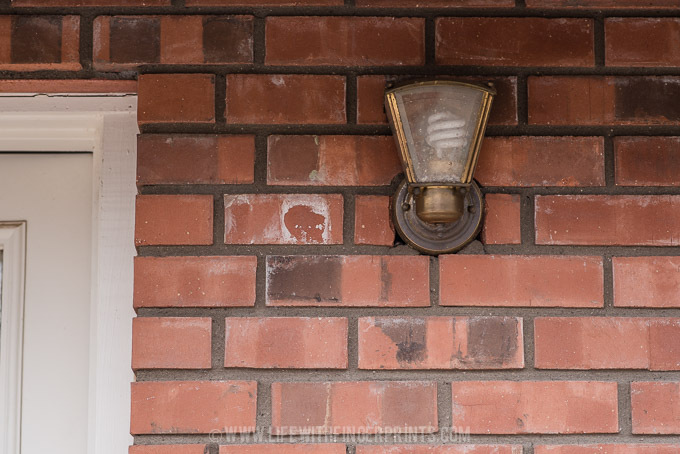 After replacing the flushmount lights we replaced the sconce lights – two by the driveway and one by our front door. I wanted something to compliment the flushmounts but not necessarily lights from the same line. 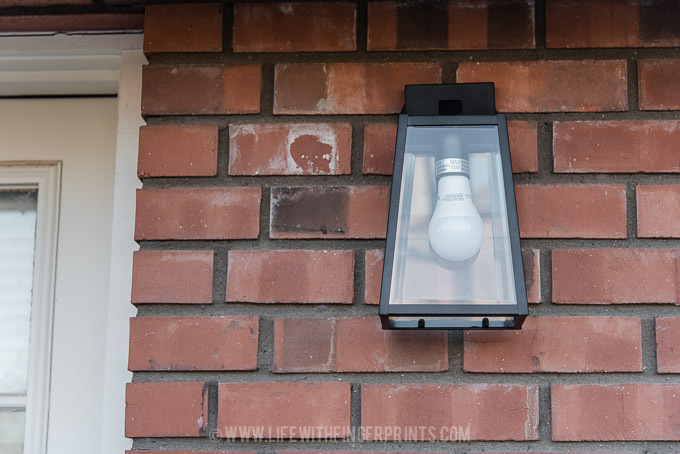 I chose to do the same lights for both locations – although the sconce by the front door is a larger version. 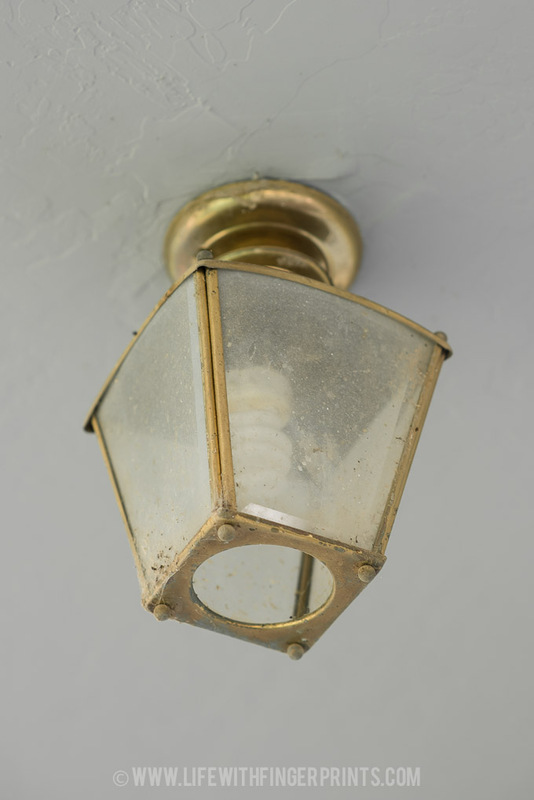 These lights were especially bad as they collected debris like crazy – when we first moved in our inspector called these a fire hazard – we’ve continually emptied the contents to avoid any problems. It was time to bid them farewell! New sleek lights to update the space. 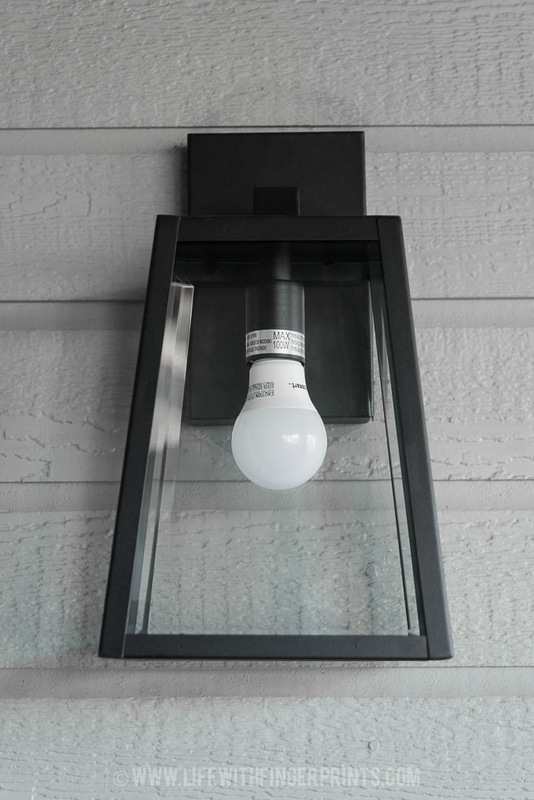 The lights that flank the garage are 11″ long where as the one by our front door is 14″. 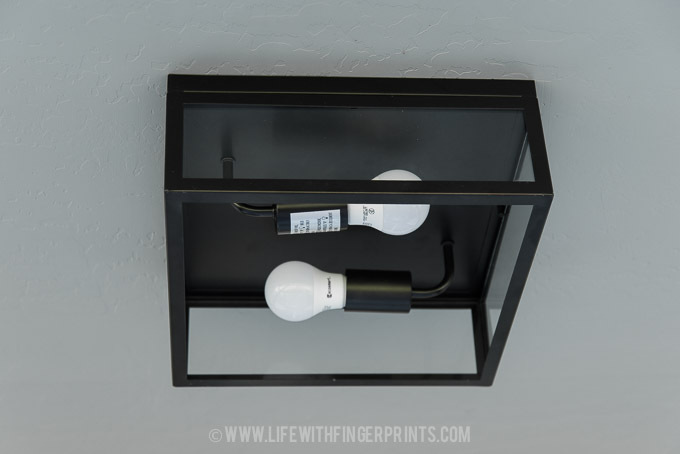 They’re made by Chloe lighting (aff link) and they compliment the flushmounts great – and they were far more affordable than some of the options I had looked at.